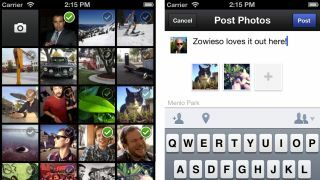 Facebook has launched its own photo creation and sharing app, just weeks after purchasing Instagram. One of the features of the app is to display photos from your Facebook friends list, giving you the option to enlarge individual photos or see more from a given album. For the first time, there is the option to upload several shots at the same time. The ability to edit photos is also included, an interesting move considering Facebook's acquisition of Instagram for $1billion just a few weeks ago. Since then, the purchase has stalled as the American Federal Trade Commission looks into whether the partnership is anti-competitive or not. With 15 filters which can be applied to photos, in an interface which is very similar to Instagram, it seems clear that Facebook is chasing the same market as its new tool. Perhaps when (or if) the Instagram deal gets the green light, all of Instagram's functionality will be integrated into the Facebook app. The launch comes in the same week that Facebook made its stock market debut, and just a few weeks after Mark Zuckerberg, Facebook's founder, admitted that the company needed to think of new ways to garner profit from mobile users. The Facebook Camera app is available as a free download from the App store. At the moment, it's only available for iOS devices - it's not known whether plans are afoot for versions for other operating systems.